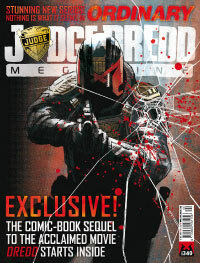 News: 2000ad launches Prog 1850, Judge Dredd Day of Action campaign, plus comic book movie sequel hits Apple Newsstand! It’s an eventful week in the world of Mega City One and it’s most famous vehicle of the law. Not only is this week’s 2000 AD a milestone issue and a fantastic jumping on point for new readers, but there’s a fantastic new creator owned series ‘Ordinary’ from Rob Williams and D’Israeli debuting in Judge Dredd’s Megazine #340 as well as a comic book sequel of the Dredd movie. But this Wednesday the 18th September is s also a day of action for fans of the recent Dredd movie who are attempting to get the movie a sequel with an international day of action. It’s never been a better time to be a digital Dredd fan! First up, let’s take a look at this week’s fantastic new issue of the Galaxy’s Greatest Comic! This Wednesday (18th September), the legendary weekly anthology comic book starts all-new strips with Prog 1850 and so is the perfect point for new readers looking to start collecting all available on your iPad via Apple Newsstand. 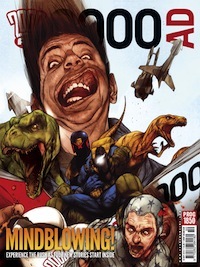 From a a clockpunk solar system, to trigger-happy cowboys fighting rampaging dinosaurs, via harsh justice in a gritty dystopia, and space soldiers fighting for an alien civilisation, there’s never been a better time to jump on board with 2000 AD! These FOUR brand new stories featuring some of the top British talent working today – including Al Ewing (Mighty Avengers), Pat Mills (Marshal Law), Ian Edginton (Victorian Undead), and INJ Culbard (The New Deadwardians). Available worldwide digitally through the 2000AD webshop or the 2000 AD iPad app on Apple’s Newsstand, it’s never been easier to start reading this powerhouse of British comics. If like us you were a huge fan of last year’s Dredd movie and are desperate for a sequel then this Wednesday it is time to join your fellow Dredd-heads in a day of action. A year on from Dredd’s initial release date, on 18th September fans across the globe are to take part in a massive Dredd Sequel Day of Action. More than 80,000 people have so far signed the official petition, with Dredd star Karl Urban supporting it too. But now the campaign for a sequel is taking things to the next level by calling for an international Day of Action! 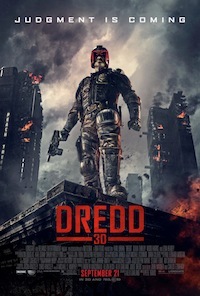 Despite critics raving about it and it hitting the top of the UK box office the Dredd film did not perform well in the US, even though it has since gone on to become a massive and consistent hit on DVD, Blu-Ray and download. But this Wednesday, everyone who has signed the petition is being asked to drive Dredd back up the charts by buying the DVD, Blu-Ray, or iTunes and Netflix download. The campaign was created by two Dredd fans, and the campaign has not only been endorsed by 2000 AD but has also shown that there is a large and vocal fan base – with the aim being to grab the attention of those who could potentially fund a sequel. So far the campaign has succeeded in consistently keeping the DVD and Blu-Ray in the charts both in the UK and America. The Dredd Sequel Day of Action aims to prove just how much demand there is for a sequel. If you want to lend your support then fans can sign the petition and also pick up the new official campaign T-shirt. September 18th is the Dredd Day of Action – are you ready, rookie? Not content with just an awesomer new issue of the galaxy’s greatest comic and a day of action to get a Hollywood movie sequel this Wednesday also sees a fantastic new issue of Judge Dredd Megazine hit Apple’s Newsstand, featuring two awesome marquee storylines. If the Day of Action isn’t enough to satisfy your need for the Dredd movie universe, then Megazine #340 feature’s the first part of a comic book sequel to the Dredd movie. Dredd: Underbelly finds Dredd and Anderson still fighting the good fight on the mean streets of Mega City One as a tsunami of crime threatens the already-troubled megalopolis. It’s written by Arthur Wyatt with art from Henry Flint and has the fantastic look and feel of the movie and so should more than enough to keep even the most rabid Dredd-head happy until the sequel starts shooting – we hope! There’s also an awesome new creator-owned series from the Lowlife team of Rob Williams and Matt ‘D’Israeli’ Brooker called Ordinary, and poses the question of what would hapen if everyone in the world got super powers but you. It’s another awesomely unique series and if you want to know more then we’ve got a fantastic preview of it with sample pages here. So as you can see, it’s never been a better time to be a fan of all things Dredd – especially digitally – and if you aren’t excitied by all this then you might end up being sent to the iso cubes for life!